Staining of formalin-fixed, paraffin-embedded human tonsil with Mouse anti Human vimentin antibody, clone AbD02701 (HCA032). Western blot of human GRANTA cell lysate, using Human anti Human vimentin antibody, clone AbD02701 (HCA032), left or clone vim3B4, right hand strip. 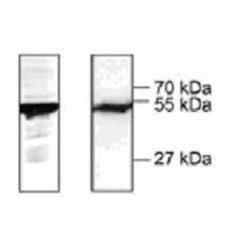 Both antibodies detect a single band of ~54 kDa. Human anti Human vimentin, clone AbD02701 recognizes human vimentin, a class III intermediate filament of ~54kDa. Vimentin is preferentially expressed in mesenchymal tissues, and within the immune system is retained throughout T-cell development, with decreasing expression in B lymphocytes with maturation. In lymphatic tissues vimentin expression is seen in marginal zone areas, but not in follicle centers. A lack of vimentin expression in B cell lymphoma is indicative of follicular center origin. Human anti Human vimentin, clone AbD02701 has been extensively characterized, and compared to an existing mouse monoclonal antibody specific for vimentin and demonstartes both an expression pattern in IHC that corresponds to Mouse anti Human Vimentin, clone VIM 3B4 and detects an identical band in western blotting. A lyophilized bivalent human recombinant Fab (lambda light chain) selected from the HuCAL® GOLD phage display library. Expressed in E. coli and purified using NiNTA affinity chromatography. This Fab fragment is dimerized via a helix-turn-helix motif. The antibody is tagged with a myc-tag (EQKLISEEDL) and a his-tag (HHHHHH) at the C-terminus of the anti-body heavy chain. Jarutat, T. et al. (2007) Selection of vimentin-specific antibodies from the HuCAL phage display library by subtractive panning on formalin-fixed, paraffin-embedded tissue. Biol Chem. 388 (6): 651-8.